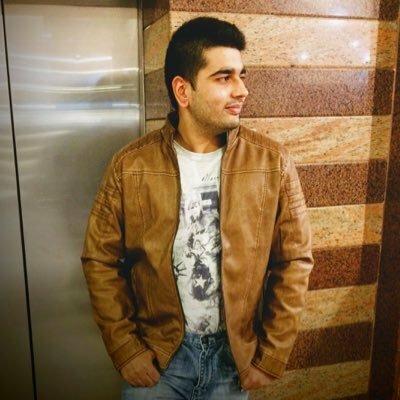 ADATA keeps releasing new hardware every now and then, some being a revamped or reshaped version of a previous product or an entirely new product all together, both ways keeping their catalogue both rich and universal. 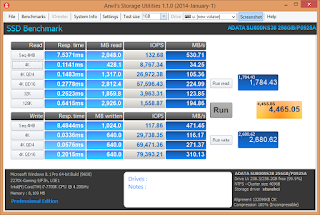 Today again we have one of their storage products for review and this time its the ADATA Ultimate SU800 M.2 256GB SSD. 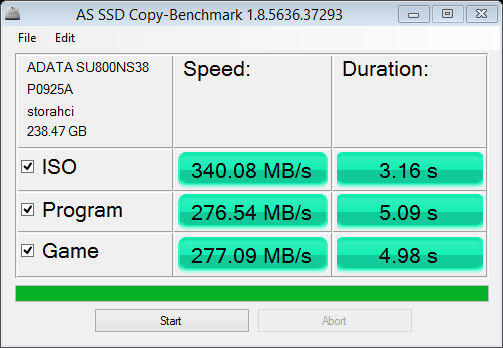 Technically this is the same Ultimate SU800 2.5' SSD but in a M.2 form factor to cover a larger base of audience. 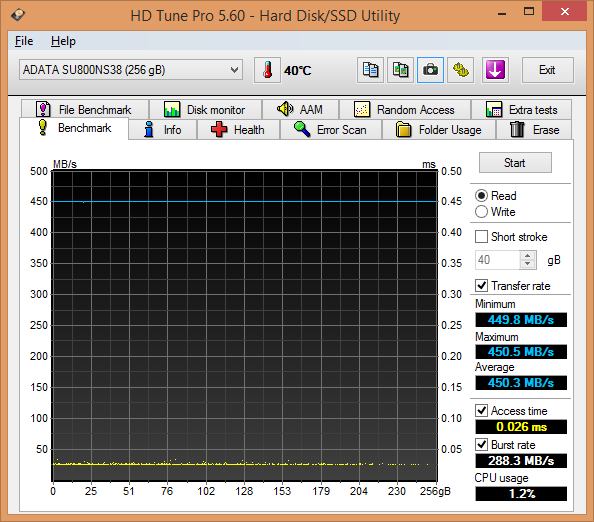 The SU800 is the second SSD in the world to use the 3D TLC NAND technology instead of the conventional 2D NAND. Its named 'Ultimate' but don't get confused since its a budget oriented drive and not a gamer/enthusiast grade drive like the ADATA XPG SX930 that we had a look at few months back. The SU800 comes in capacities from 128GB going all the way upto 1TB though the 1TB variant is still to see the day light! Claimed by ADATA to have read/write speeds of 560MB/s and 520MB/s respectively the one we have today is the 256GB variant carrying a price tag of $85 or Rs 6000 in India making it a entry level SSD. With the SU800 M.2 ADATA has brought in a welcome change to their packing style and shifted to a glossy multi-color packaging from the plain white one. The front clearly specifies the drive capacity, the brand logo and a big product image along with the product name at the bottom left corner. Looking at the Ultimate SU800 you'll notice that its small, I mean like very very small! 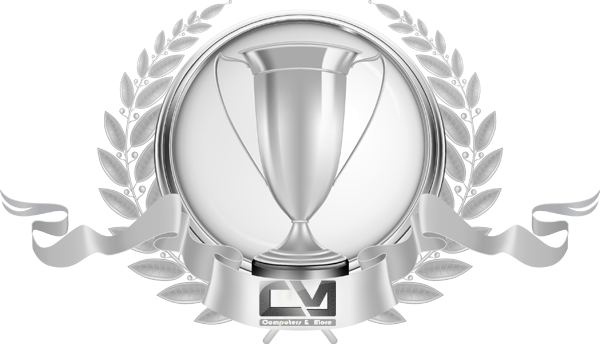 It complies with the 2280 form factor & hence, measures at just 22mm x 80mm x 3.5mm. 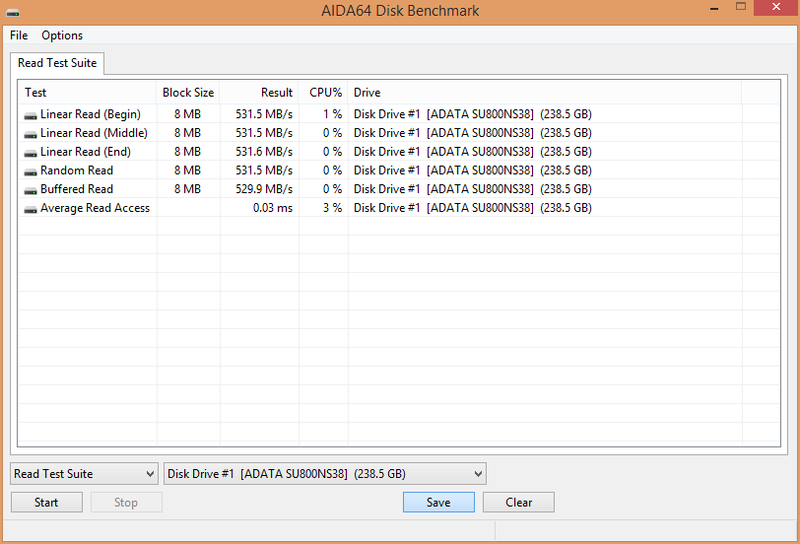 Its a good thing since most motherboards only support M.2 drives of upto 80mm in length making the ADATA SU800 M.2 quite a universally compatible drive. Since this is a 3D NAND based drive so the PCB is bare at the bottom since chips are twice in density over a conventional NAND chip. The top has a controller, DRAM buffer and three 3D NAND chips to complete the package. The controller over here is the entry level Silicon Motion, Inc (SMI) SM2258H which is a quad channel controller supporting Low-Density Parity Check Error Code Correction (LDPC ECC), TBW (total bytes written), DEVSLP (Device Sleep) and even RAID but has no support for AES-256 data encryption. The 3D TLC NAND on the SU800 are from Micron model number NW838. Each die is a 384Gbit chip with and has 96GB of storage capacity giving the drive a raw capacity of 288GB in total. Besides, the SU800 drive uses a pseudo-SLC caching by dedicating one third of the 384Gbit from the Micron 3D TLC NAND chips creating a large buffer! If its been implemented effectively then we can expect high performance from this drive. 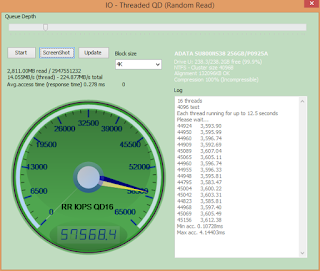 A a dedicated 256 MB of DDR3 DRAM cache is also provided to compliment this installation. The module used is the Nanya NT5CC128M16IP-DI IC and is DDR3L-1600 with 11-11-11 timings. 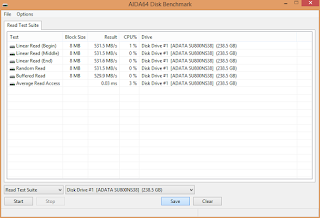 We used a new test bench to benchmark the ADATA Ultimate SU800 M.2 SSD. Crystal Disk Info shows us that a bunch of useful SMART attributes are presented to the end user. Total reads and writes as well as NAND writes are shown. 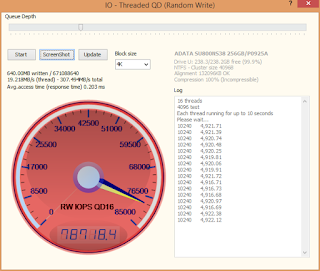 TRIM, NCQ, and DevSleep are shown to be supported as well. The firmware version we are testing with today is version P0925A. As we can see the drive is hitting the exact advertised speed over here with 563Mb/s read speed though 508Mb/s write speed is a bit lower than the 520MB/s mark but that can be a system anomaly. As we can see that the drive is hitting great speeds and is extremely consistent in read and write activities. 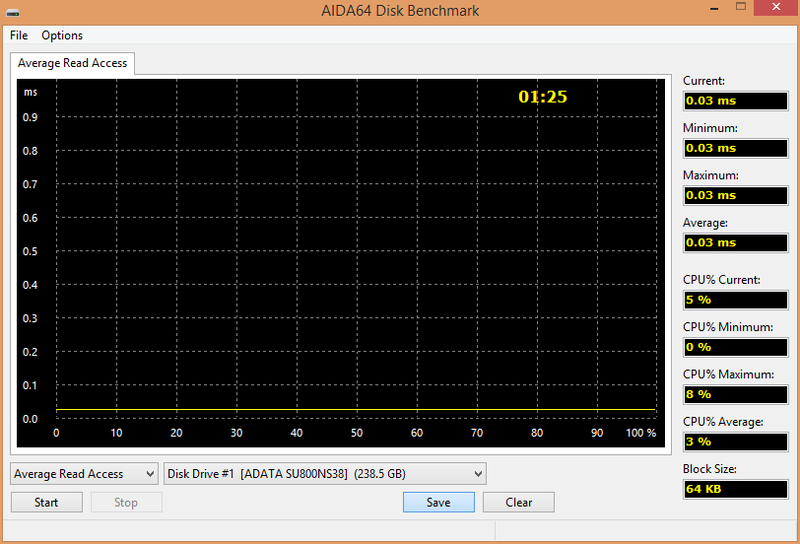 At 450.3Mb/s average read speed and a very consistent graph the drive is definitely performing well. With 68783 as the total score and minimum speed at 240.467Mb/s in the 'adding music to Windows Media Player' test the drive comes up with some very impressive stats. This is important since these are emulation of real life usage! 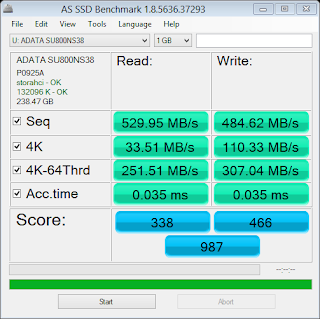 The ADATA SU800 2.5' SSD was the second in the market to use the newly developed 3D NAND technology and the same blueprint and components have been used to create the SU800 M.2 SSD that we reviewed today. Since both these products are same under the hood their merits and demerits are similar aswell. The SLC buffer once filled up due to large data size being written on it brings down the write speed of this SSD to a abysmally low number which can reflect as a slow boot time if used as a primary drive. 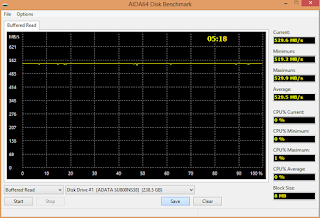 Apart from that the performance of this SSD has been an identical match with the spec sheet provided by Adata and scores beautifully in the PCMark 8 suite which is as close as it gets to real world performance. Adata took a clever step by introducing the M.2 version of the SU800 since you cannot find many M.2 SATA III SSDs in the market today that offers such respectable performance and capacity at a 6K INR price tag! Also as M.2 SSDs are conventionally secondary storage drives the SU800 gains more value as its slow speed as aboot drive gets somewhat hidden. The 'Ultimate' tag might not be justifiable by performance but as an over all package we can consider it to be true to some extent. I recommend the Adata Ultimate SU800 M.2 SSD to anyone who's looking for a high capacity M.2 drive for his desktop or laptop coming in at an affordable price and backed up by a three years warranty period.